Obsessed with the instant gratification of taking pictures with his iPhone, designer-photographer Dan Marcolina dedicated an entire year to a series of mobile image experiments. His amazing results and the post-processing steps on the iPhone to achieve them can be found in this gorgeous four-color photography guide. Part inspiration and part how-to, iPhone Obsessed is filled with eye-popping images and coverage of 47 of the best iPhone photo applications. Without ever leaving your iPhone, you learn to create artistic effects such as blurs and vignettes, high dynamic range, film looks, black and white, and more. Marcolina takes you through the construction of his images, explaining which apps he used and why. You'll not only be inspired to create hang-on-the-wall art with your iPhone, but you'll know exactly what apps to use and where to get them. iPhone Obsessed also interacts with your iPhone. In the introduction, the author explains how to scan one of the 75 custom Microsoft Reader Tags in the book using a free iPhone tag reader (http://gettag.mobi). These tags uncover another virtual layer of information, includingfour hours of bonus video tutorials, app developer Web sites, and links to the iTunes Store for app purchase along with inspirational image galleries to swipe through. He also includes several bonus textures that he created for you to download and use on your images. For Apple iPhone 3GS, iPhone 4G, and iPod touch 4 users, this guide will raise the standard of iPhone photography and show how the combination of picture choice and multiple app processing can turn an ordinary image into a work of art. To coincide with the launch ofiPhone Obsessed, Marcolina plans to release a tablet companion version for the iPad, featuring interactive demonstrations from the book and new app formulas. Learn more at http://www.marcolinaslate.com/iphoneobsessed/. "Some incredible images and very inventive processes. This book is full of useful and unexpected creative solutions. It inspired me to download some of the apps and use Dan's tips and techniques!" 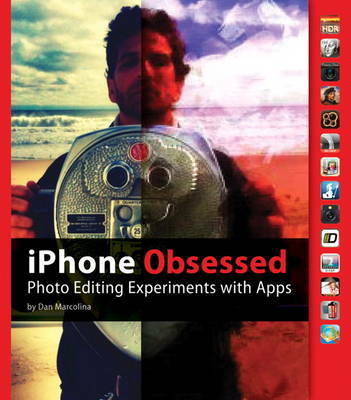 "...this is without doubt the best iPhoneography book I have read as part of my book review series, and with its learning and interactive approach, in my opinion is a must have book for any iPhoneographer, new or seasoned." "...very interesting is an understatement. " "Dan Marcolina takes iPhone Photography to the next level." "...this book is well worth it and you won't be sorry you added it to your library."